FEIN Dustex 25L Wet & Dry Dust Extractor 230v. Fein Dustex 25L Wet and Dry Vacuum Cleaner 230v - powerful FEIN dust extractor that connects to power tools for dust extraction when working in confined spaces. Fein Dustex is the ideal companion for Fein Multimaster power tools! Auto start socket with switch-on delay that helps to avoid power surges. Powerful turbine for class-leading performance - 72 l/s volumetric flow and 253 mbar vacuum. Tool collar with suction force regulation to easily set the suction power. Large working range due to 4 metre suction hose and 6 metre cable. 360° rotating castors for easy manoeuvrability in tight spaces. 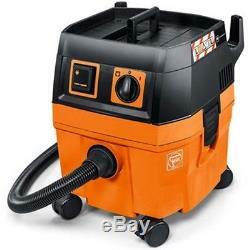 Fein Dustex 25 litre wet and dry dust extractor (230v). 4 metre suction hose with 35mm diameter. M Class cellulose filter and fleece filter bag. Air flow rate: 4320 l/min. Sound pressure level: 67 db. Cable with plug: 6 m.
Please note that the machine itself is L class, but the M class filter provided allows filtration to M class standard. The machine does NOT have an audible alarm when the suction drops, so can't be described as an M class machine. The item "FEIN Dustex 25L Wet & Dry Dust Extractor 230v Vacuum Cleaner M Class Filter" is in sale since Monday, May 18, 2015. This item is in the category "Business, Office & Industrial\Industrial Tools\Dust Extractors". The seller is "buybrandtools" and is located in Sheffield, South Yorkshire. This item can be shipped to United Kingdom, United States, Canada, Ireland, Australia, Germany, France.